live in and on the leaves (and other above-ground plants parts) of over 450 plant species in more than 75 plant families. They are commonly found on hostas, but can affect other herbaceous ornamentals (e.g., African violet, anemone, begonia, chrysanthemum, fern, orchid, veronica) and woody ornamentals (e.g., azalea, elm, privet), as well as fruit crops (e.g., sour cherry, strawberry) and vegetable crops (e.g., broccoli, celery, lettuce, onion, pinto bean, potato, squash, tomato). 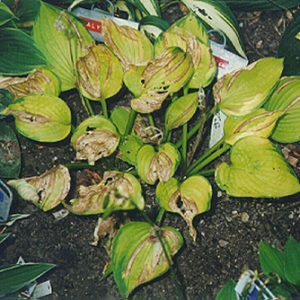 Damage from foliar nematode is usually cosmetic and non-lethal making ornamental plants less attractive and less saleable. In severe cases and on particularly susceptible hosts (e.g., strawberry), foliar nematodes can cause extensive leaf injury and defoliation, and can interfere with and limit flowering. nematodes cause damage to above-ground plant parts, especially leaves. In young plants, foliar nematodes can cause new growth to curl, twist, and stunt. In more mature plants, foliar nematodes cause small, discolored, angular (i.e., straight-edged) blotches on leaves. The blotchy areas are typically bordered by veins. 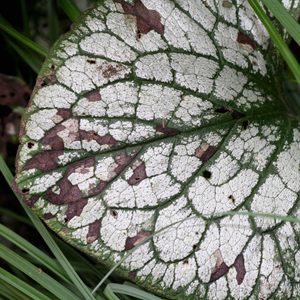 Blotches eventually turn brown and dry, and may fall away, giving the leaf a “shot-holed” appearance. Angular blotches often are not apparent until late in the growing season (e.g., August). How do I save a plant with foliar nematodes? Eliminating foliar nematodes is virtually impossible. No chemical products are available for foliar nematode control in home gardens. Hot water treatments have been developed to treat high-value plants, but are not recommended for home gardeners. Exact temperatures/timings for these treatments vary depending on the type of plant being treated, and missteps in timing/temperature can either kill plants or can lead to less than 100% control of the nematodes. If you have plants infected with foliar nematodes, the best course of action is to dig them up, bag them and remove them from your garden as soon as you notice symptoms to reduce the risk of the nematodes spreading to healthy plants. After working with infected plants, wash your hands with soap and water and decontaminate anything that has come into contact with the plants (e.g., tools, pots, bench surfaces, etc.) for 30 seconds with either 70% alcohol (e.g., rubbing alcohol) or 10% bleach. Spray disinfectants that contain approximately 70% alcohol can also be used. Because soil is virtually impossible to decontaminate, avoid planting susceptible hosts in an area where foliar nematodes have been a problem. How do I avoid foliar nematode problems in the future? The easiest way to avoid problems with foliar nematodes is to not bring them into your garden. Carefully inspect plants for nematode symptoms before purchase, but keep in mind that plants may not show symptoms early in the growing season. Avoid using overhead sprinklers as watering in this manner can splash foliar nematodes from plant to plant and promote spread. Instead use a soaker or drip hose that applies water directly to the soil, rather than onto leaves. Space plants far enough apart so that potential spread via water splash during natural rains is minimized, and avoid working with plants when they are wet. DO NOT use foliar nematode-infected plants or even healthy-looking plants suspected to be infested with foliar nematodes when taking cuttings to propagate plants.